NDP Leader Jagmeet Singh announced on Wednesday he will run in a by=election in Burnaby South. Federal NDP Leader Jagmeet Singh wants to be the next MP for Burnaby South, and sees gaining the votes of disaffected supporters of Prime Minister Justin Trudeau as his path to victory in an eventual by-election. In the 2015 federal election, the Liberals came within 547 votes of New Democrat Kennedy Stewart, who won the riding but is stepping down next month to run for Vancouver mayor. 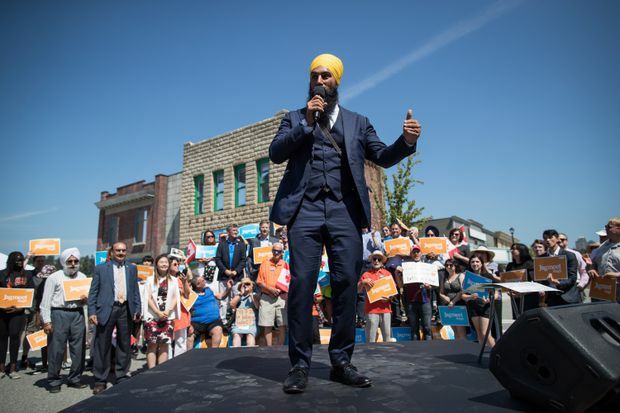 On Wednesday, Mr. Singh announced a commitment to Burnaby South that includes moving with his wife to the riding and making it his federal political base if he is elected. “I am all in on Burnaby,” Mr. Singh told a news conference. A by-election must be called within six months of Mr. Stewart’s Sept. 14 exit from the riding. Asked about the timing of such a vote, the Prime Minister’s Office said it had no comment on the issue. It would be a major shift for Mr. Singh, who was a member of the Ontario legislature for the Toronto-area community of Brampton before becoming NDP Leader 10 months ago. In kickoff remarks, Mr. Singh ticked off policy areas such as affordable housing, the lack of a pharmacare program and income inequality as issues where the the federal Liberal government has failed to act. He also accused Mr. Trudeau of having “betrayed” voters by backing off on promised electoral reform. “We can’t afford to wait. New Democrats are determined, are committed to ensuring people get the solutions they need right now,” Mr. Singh said. He denounced federal spending to buy the Trans Mountain pipeline, but declined to offer specifics about what he would do with the infrastructure, such as selling it, if given the opportunity to deal with the file. “My staring point is we should not make that investment,” he said, adding he prefers clean-energy jobs. Mr. Singh said he would, “yes, absolutely" remain NDP Leader if he loses any by-election. In a 2015 essay titled How I Survived Trudeau’s Red Tide, Mr. Stewart wrote that it was a “tough” fight to win Burnaby South, and that while Liberal Adam Pankratz secured more votes on election day, advance polling put the NDP over the top. He wrote that it took more than a year of planning to recruit volunteers, identify supporters and raise the funds to compete and win the seat. In an interview on Wednesday, Mr. Stewart said he expected the by-election will be a different dynamic. He said he expected that Trans Mountain, especially the purchase of the pipeline, will work against the Liberals. Turnout will drop, Mr. Stewart said, as in most by-elections, but Mr. Singh’s profile as a national leader will galvanize support, and he will also have the resources of four Burnaby NDP members of the provincial legislature to draw from. “You can’t take anything for granted, and I know Jagmeet won’t,” he said. Mr. Pankratz said he has yet to decide if he will run again in a by-election. A business professor at the University of British Columbia, Mr. Pankratz said he did not think Trans Mountain was a defining issue in the riding, saying it’s in the mix with affordability and housing, middle-class economic concerns and the renovation of older rental housing that has left some seeking new places to live. On occasion, parties will not run a candidate against a party leader seeking a seat in a by-election. However, both the Liberals and the Tories say they will run someone to challenge Mr. Singh. Scott Lamb, president of the Conservative Party of Canada, said in an interview on Wednesday that the party has been waiting to see if and where Mr. Singh will seek a seat. While they have no candidate for the riding at the moment, Mr. Lamb said there will be a contested nomination to pick a Tory candidate in Burnaby South.